John Porter Mace, oldest son of John Hancock Mace and Ellen Porter Mace, was born November 18, 1847, in Clermont County, Ohio. Prior to the Civil War he was a farmer and lived in Monroe Township, Clermont County, Ohio. On September 7, 1864 John Mace enlisted in the Union army as a volunteer in the 11th Regiment Ohio Infantry. He enlisted as a substitute for Philip P. Kennedy of Monroe Township. He was sent to Atlanta, Georgia in October 1864 and was eventually assigned to Company I of the 11th Ohio at Cherokee Hill, North Carolina, on January 21, 1865. His service was brief as he was captured by Confederate forces on March 3, 1865 at Blakely's Crossroads. He was returned to Union custody on April 2, 1865 at Aiken's Landing, VA, and paroled back home to Ohio. He ultimately received his discharge at Camp Chase, Ohio, on June 20, 1865. John Mace was an architect and builder in Ohio and on January 4, 1871, he married Mary Luella Poole at Bethel, Ohio. They moved to Lake Helen in Volusia County, Florida, about 1884 with their son Loring Poole Mace. There John Mace became a community leader. He was one of the incorporators of the town and was Lake Helen's first mayor. Their second child, Marjorie Lorraine Mace, was born in Lake Helen in 1890. In Lake Helen, John Mace built his home ("Edgewood" - 1886) and several other homes and businesses. In DeLand he built DeLand Hall (1884), Stetson Hall (1886) and the Volusia County Courthouse (1889). He also had citrus groves and ran the Mace & Son Packing House, a citrus packing house, using the "Edgewood" brand. In 1910 John Mace was an organizer of the Lake Helen Hotel and Realty Company and later helped organize the First National Bank of DeLand. John Mace died on January 23, 1929 at Lake Helen. His wife died two days later. They are both buried at Oakdale Cemetery at DeLand, Volusia County, Florida. You can return to this page anytime by clicking the Mace link on the top menu. Beginning about 1800 in Philadelphia. Beginning about 1790 in Scotland to Clermont County, Ohio, and then all over. Photographs and incriptions of the headstones in the MACE section. Photos of John Porter Mace, Mary Luella Poole Mace and Loring Poole Mace. 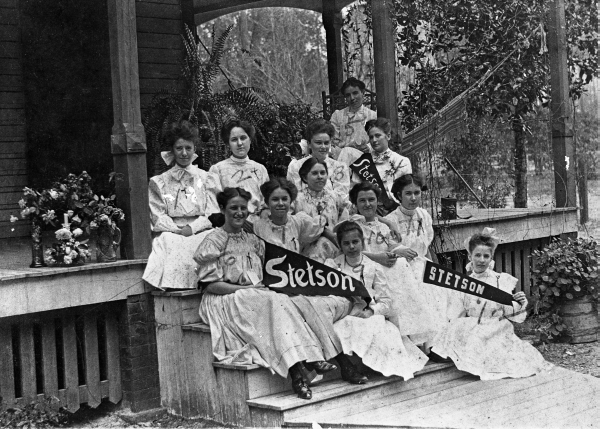 There is also a photograph of "Edgewood" from the late 1800's to compare with the 1968 photo in the Florida Archives (below). 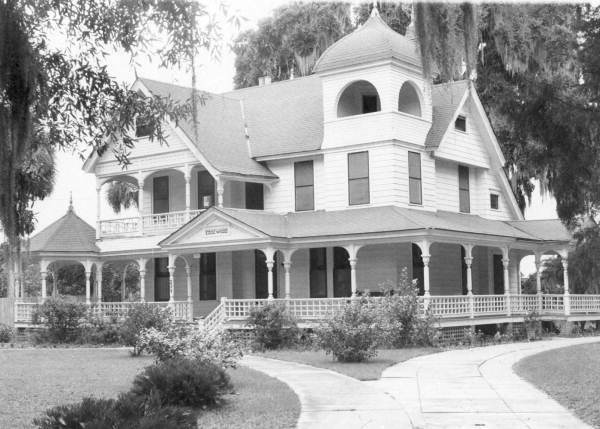 A 1968 Florida State Archives photograph of "Edgewood," the home John Porter Mace built in Lake Helen in 1886. There is another picture of "Edgewood" in the photo gallery. 1. Emilie Hibbard 2. Fannie Robertson 3. Irene Campbell 4. Sally Clarkson 5. Aunt Clara 6. Corinne Pelton 7. Hannah Detwilder 8. Edith Bond 9. Minerva Bond 10. Bessie Coulter 11. Marjorie Mace 12. Sarah Hargreaves.